With the return of several high-profile designers, like Opening Ceremony, Proenza Schouler, Rodarte and Rihanna, this New York Fashion Week was filled with promise. And boy did it deliver. Aside from the fun and excitement — Opening Ceremony’s “The Gift of Showz” drag extravaganza; Rihanna’s silk-and-lace-filled celebration of womanhood where a nine-months-pregnant Slick Woods hit the runway wearing nothing but pasties — the lineups embraced a level of diversity beyond what, not long ago, anyone would have thought imaginable. Close to one-fourth of New York’s shows featured over 50 percent models of color — and that’s not all. Every single category we examined hit record highs. Could it be a new day is dawning? 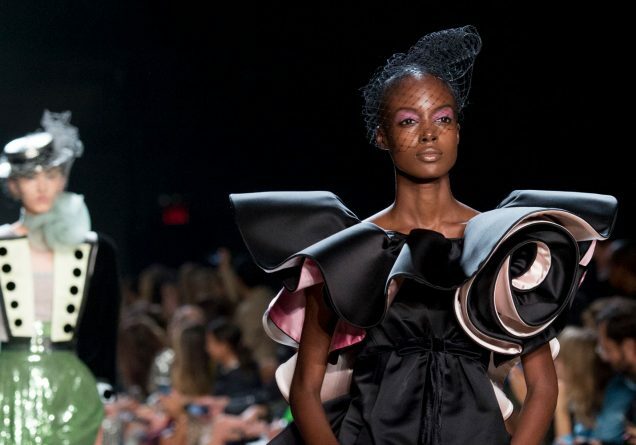 We’re happy to report that racial diversity on the runways reached an all-time high during New York Fashion Week’s Spring 2019 season. After reviewing 76 major shows and 2,203 model appearances, we found that 44.8 percent of runway castings were models of color — that’s nearly half. 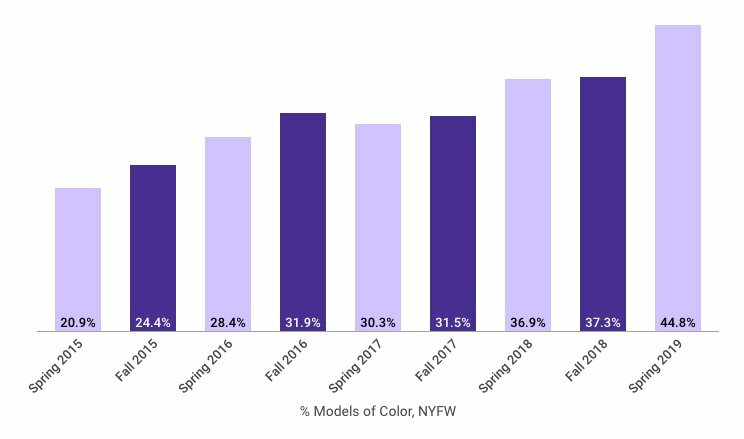 It’s also a sharp (7.5 point) increase from Fall 2018’s 37.3 percent and, for comparison’s sake, more than double the 20.9 percent nonwhite models we saw in Spring 2015 when we first began tracking runway diversity. This is the first season that nonwhite models have accounted for over 40 percent of castings and the fourth wherein every New York runway show included at least one model of color. This season, women of color ruled our most-booked models list. Of the 11 models who racked up the most New York Fashion Week runway appearances, more than half (seven) were nonwhite. This marks the first time since Fall 2017 that the majority of the season’s top models were of color. What’s more, South Korean model Yoon Young Bae actually tied for most-cast model alongside Maastricht-born beauty Kiki Willems. Both have been runway regulars since around 2016 and both appeared in 12 Spring 2019 shows in New York. In second place came Sudanese-Australian model Adut Akech, who booked 11 shows. The remainder of the list, which includes Chinese-Nigerian model Adesuwa Aighewi, Dominican model Anyelina Rosa, African-American model Selena Forrest, Chinese model Chen Siqi and South Korean model Sora Choi, booked 10. No transgender, plus-size or over-50 models made the top 11. More exciting news: casting of plus-size talent also reached record highs. A total of 49 plus-size models (2.2 percent) walked in 12 shows in New York, a vast improvement over last season’s 27 in 8 shows (1.2 percent) and Spring 2018’s 34 in 12 shows (1.3 percent). Still, it’s telling that the number of designers opening their runways to fuller-figured models stays roughly the same season after season. As we’ve come to expect, Chromat’s roster was the most size-diverse of the season. Among Becca McCharen-Tran’s water-soaked beauties were Seynabou Cissé, Hayley Foster, Emme, Mia Michaels, Jazzmine Carthon, Victoria Gomez, Priscilla Huggins Ortiz, Mia Kang, Ericka Hart, Kimberly Drew, Velonika Pome’e, Sonny Turner and Mei Qin. That’s 13 plus-size models total. As presaged by Savage x Fenty’s viral ad campaign, newly anointed New York Fashion Week closer Rihanna cast more plus-size models (12) than any designer besides Chromat. RiRi’s Fall 2018 see-now-buy-now lingerie Eden was filled with women of “all body types and all races and all cultures,” among them Paloma Elsesser, Molly Constable, Anita Marshall and Lulu Bonfils. Per usual, Christian Siriano was responsible for another significant chunk of the season’s plus-size castings. The red carpet regular included eight plus-size models — Marquita Pring, Candice Huffine, Sabina Karlsson, Foster, Precious Lee, Alessandra Garcia Lorido, Ali Tate and Georgina Burke — in his Hawaii-inspired Spring 2019 show. Only 16 plus-size castings occurred outside Chromat, Savage x Fenty and Christian Siriano. Sies Marjan, Collina Strada and Yuna Yang joined the fight for body inclusiveness, the latter hiring Alexander McQueen alum Betsy Teske and America’s Next Top Model Cycle 24 favorite Khrystyana Kazakova. Back from its season-long hiatus, diversity stalwart Tome tapped Cissé and Constable. Gypsy Sport’s reliably unconventional, gorgeous cast featured model Sushunny (who also starred in the brand’s Fall 2018 campaign) and makeup artist Raisa Thomas. Eckhaus Latta invited Elsesser back for a third season; Pring, Huffine and Yvonne Simone took part in Carly Cushnie’s first solo show. As for the big-name brands: since Fall 2017, Prabal Gurung and Michael Kors have regularly prioritized inclusivity and this season was no different. Ashley Graham, the first plus-size model to walk in any Kors show, returned for her fourth consecutive season, Karlsson for her third. At Gurung, Huffine made her fourth appearance, Pring her second. It’s heartening that, of the season’s 49 plus-size castings, 35 went to women of color. What’s more, of the 14 remaining (white) castings, two went to plus-size women over the age of 50 — Emme and Michaels, both at Chromat. Still, McCharen-Tran remains the only designer to give work to older plus-size women and the week was sorely lacking in transgender and non-binary plus-size representation. All in all, it’s a great sign that size diversity on the runways is up, especially after last season’s stumble (between Spring 2018 and Fall 2018, the number of plus-size castings fell by seven) and the Fall 2018 print campaigns’ feeble plus-size turnout (only seven plus-size models landed campaigns, a record low). Plus, slowly but surely, more commercial designers seem to be getting the size diversity memo, which bodes well for the plus-size consumers hoping to actually wear the spring collections. Visibility of transgender women and non-binary models continues to improve steadily, both on the runways and in ad campaigns. Trans women and non-binary models landed 53 runway appearances for Spring 2019 (in other words, 2.41 percent). That’s an all-time high and a monumental leap forward from Fall 2018’s 33 (1.44 percent) and Spring 2018’s 31 (1.19 percent). To break it down, 49 openly transgender women and four non-binary models walked in a total of 20 New York shows, the widest distribution of castings seen in any of the nonracial categories. Helping to boost this season’s numbers was the addition of Los Angeles-based underwear brand Marco Marco to the calendar. Designer Marco Morante hired exclusively transgender models for the brand’s Collection Seven show and in so doing made history. Per Mic, it was “the most trans men ever assembled on a NYFW runway.” The 34-strong lineup included 15 trans women, among them Transparent’s Trace Lysette, YouTube star Gigi Gorgeous and models Geena Rocero, Carmen Carrera, Dominique Jackson and Arisce Wanzer. Gypsy Sport, a brand known for making statements and for its patently inclusive runways, had the second-highest number (eight) of trans women and non-binary castings (seven trans, one non-binary). 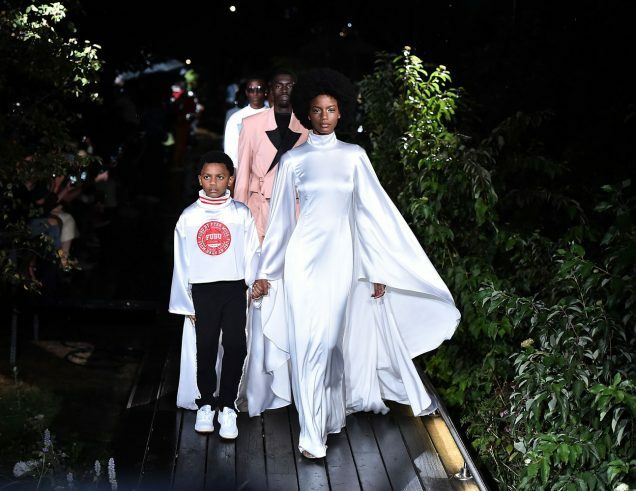 Drag queen West Dakota and model/activists like Maya Monès, Munroe Bergdorf and Leiomy Maldonado presented the brand’s Spring 2019 collection, 99 percent of which was made from sustainable or repurposed materials. Opening Ceremony’s Spring 2019 show, “a live spectacle celebrating of the art of drag — both in New York and around the world,” featured four trans women: Wanzer, Monès, Valentina Sampaio and Oslo Grace, who identifies as non-binary. It also starred several drag queens, one of them (Dakota) non-binary. The Blonds, a known haven for those who like beaded costumes, drag queens, gender inclusivity and/or fun, featured four trans and/or non-binary runway stars: Maldonado, Jackson and Gisele Alicea plus the brand’s co-founder and designer Phillipe Blond, who identifies as non-binary. Chromat, which typically puts forth (one of, if not) the most trans-inclusive show(s) of the week, hired Rocero, Carrera and Monès, all seasoned Chromat alums. Importantly, it wasn’t just “fringe” or activist brands that gave trans and non-binary talent their due. Monse, Michael Kors, Tory Burch, Jeremy Scott and Oscar de la Renta tapped Teddy Quinlivan. Helmut Lang alum Hunter Schafer walked at Coach 1941 and Matthew Adams Dolan; non-binary model Grace at Dion Lee and Coach 1941. For the second season in a row, Eckhaus Latta cast Massima Lei, who also made her Kate Spade New York debut. Ariel Nicholson — née Murtagh — walked at Proenza Schouler and Calvin Klein (for a third consecutive season). Later, she made her sophomore Marc Jacobs appearance alongside fellow Jacobs alum Dara Allen and non-binary model Finn Buchanan. (Allen also appeared at Prabal Gurung, R13 and Coach 1941.) Note that two luxury brands tied Chromat for number of trans/non-binary models featured: Coach 1941 and Marc Jacobs. Jacobs, for one, has made trans representation a priority for several seasons now. All in all, it’s highly encouraging that trans and non-binary models were able to land so much high-exposure work. There’s no denying that the industry’s — and especially New York-based brands’ — attitude toward trans and non-binary models seems to have shifted. Optimists might say it’s the political climate; pessimists might point to the fact that genderqueer models, unlike women over 50 or plus-size models, can give the illusion of “diversity” while still catering to Fashion’s tall, young, thin, androgynous ideal. After all, no plus-size or older trans/non-binary models were booked. 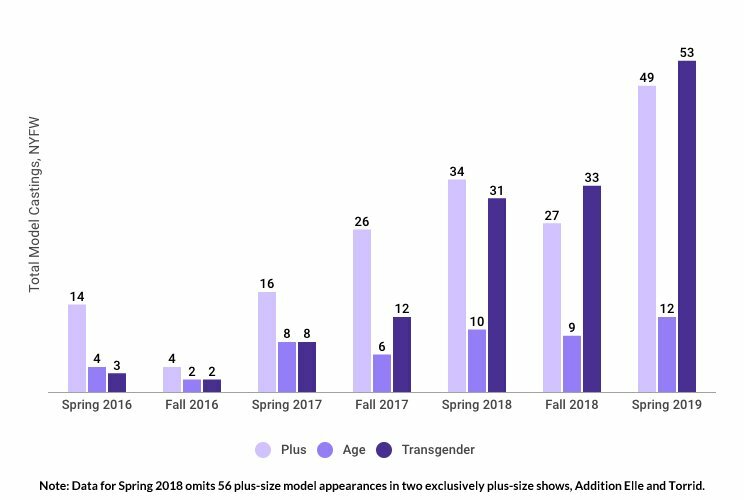 That said, over half (29) of Spring 2019’s trans/non-binary castings did go to models of color. For Spring 2019, a new casting trend emerged in New York. Three brands — Opening Ceremony, The Blonds and Gypsy Sport — cast a total of 25 drag performers. (That’s more than twice the number of over-50 models booked.) While fashion designers have long been inspired by LGBTQIA+ culture, it’s rare that they invite members of the community to model their designs, which made these castings that much more significant — and refreshing. 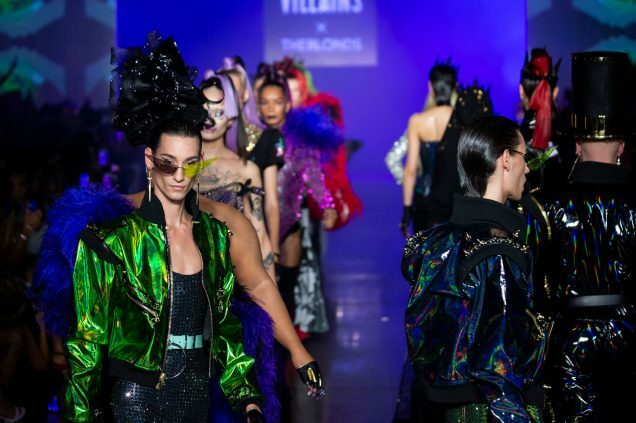 Opening Ceremony’s nontraditional Spring 2019 runway, MC’d by RuPaul’s Drag Race winner Sasha Velour, had a cast of 100 percent LGBTQIA+ models, 21 of them drag queens. Said performers included Drag Race alums Miss Fame, Jiggly Caliente and Shea Couleé as well as reigning Mr(s). Brooklyn West Dakota and Berlin-based multidisciplinary artist Hungry (Björk’s sometimes makeup artist). What’s more, the presentation/drag extravaganza doubled as a fundraiser for the Transgender Law Center. Dakota also turned up at Gypsy Sport, as did yet another RuPaul’s Drag Race alum, Nina Bo’Nina Brown; Hungry made a second New York Fashion Week appearance at The Blonds. Unsurprisingly, Opening Ceremony, The Blonds and Gypsy Sport took a holistic approach to LGBTQIA+ representation: 9 of the 25 castings went to nonwhite performers, two to a non-binary model (Dakota). Women over the age of 50 were the least represented of all the groups, as has been the case for the past four seasons (beginning in Fall 2017 up to and including Spring 2019). Relatedly, this was also the category that saw the least drastic change. New York had 12 (0.54 percent) over-50 castings for the Spring 2019 season, as compared with nine (0.39 percent) for Fall 2018. That said, Spring 2019 was the most age-diverse New York Fashion Week on record. (Spring 2018 trails closely behind with 10 castings.) We have seven brands to thank for this success. Per usual, the majority (Sies Marjan, Chromat, Tome, Collina Strada) are of the newish guard of young, “edgy,” ambivalently commercial designers. The rest (Polo Ralph Lauren, Zero + Maria Cornejo, Calvin Klein) are New York institutions: well-established, but not necessarily “old school.” Cornejo is known for her emphasis on sustainability; Calvin Klein is headed up by one of the most iconic designers in the biz, Raf Simons. Sies Marjan, Chromat, Tome, Polo Ralph Lauren and Zero + Maria Cornejo each hired two over-50 models, Calvin Klein and Collina Strada one. Sander Lak of Sies Marjan cast his mother, Marjan, as well as Jacky O’Shaughnessy of American Apparel fame. Said Lak to Vogue: “This one was emotionally intense … my mother was in the show, as were friends from college, new friends, old friends, people I work with, and models that we love.” Further evidence that friends and family casting strategies help push inclusion forward. Once again, Chromat was the only brand to hire any plus-size women over age 50 (Emme and Michaels). Tome and Zero + Maria Cornejo were the only shows to feature a nonwhite woman in this age group, bringing the grand total of over-50 racial minorities cast to two. Transgender women were completely left out of this season’s over-50 castings. 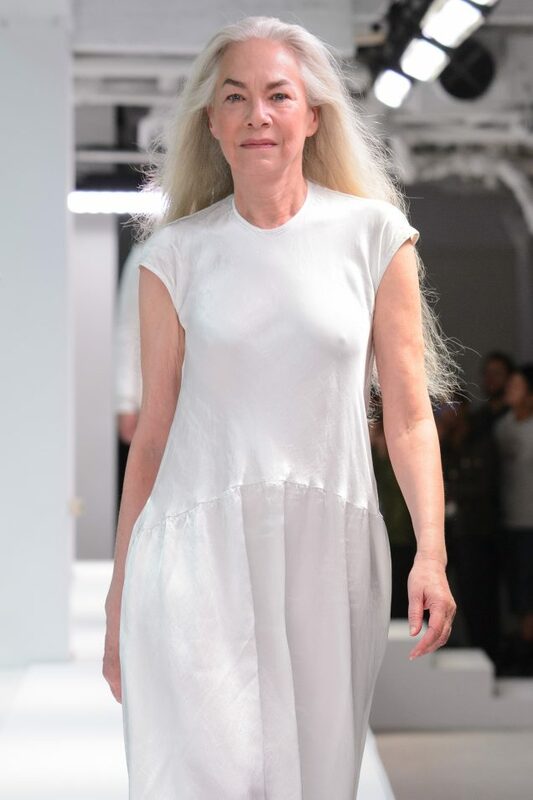 It’s worth noting that Eckhaus Latta, a brand that routinely prioritizes age inclusivity, did feature two older models in its lineup, but they did not fall into the over-50 category. As stated earlier, there were thankfully no entirely white shows, although two brands — Zang Toi and Tadashi Shoji — did come inexcusably close. The former, a repeat offender, cast only one model of color in a lineup of 14 (7.14 percent), the latter 2 out of 18 (11.1 percent). Clearly, diversity still isn’t a priority for everyone. But for many New York designers, it is. To wit: 23 of the 76 shows we examined featured casts that were at least 50 percent nonwhite. 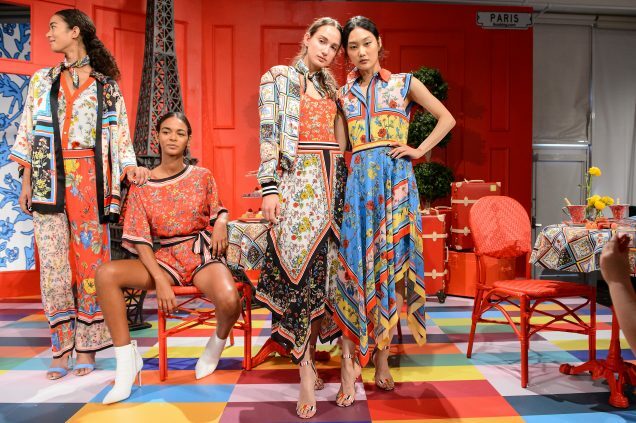 Spring 2019’s racial inclusivity standouts include Pyer Moss (100 percent models of color), Claudia Li (100 percent models of color), Chromat (91.7 percent models of color), LaQuan Smith (76.5 percent models of color), Gypsy Sport (76 percent models of color), Prabal Gurung (75.6 percent models of color), Savage x Fenty (71.7 percent models of color), Christian Cowan (71.4 percent models of color), Cushnie (66.7 percent models of color), Tome (63.6 percent models of color), Kate Spade New York (63 percent models of color), Oscar de la Renta (60.9 percent models of color), Matthew Adams Dolan (60 percent models of color), Marco Marco (60 percent models of color), Kuho (58.8 percent models of color), The Blonds (58.8 percent models of color), John Elliott (58.8 percent models of color), Christian Siriano (58.5 percent models of color), Michael Kors (56.4 percent models of color), Brandon Maxwell (55.8 percent models of color), Area (55.6 percent models of color), Mansur Gavriel (52.9 percent models of color) and Monse (50 percent models of color). The list of brands that made a concerted effort to embrace multiple forms of diversity is slightly shorter. Similarly, though, it’s a healthy mix of early diversity adopters, “disruptive” young labels and newly conscious luxury brands. For Spring 2019, Chromat, Gypsy Sport, Prabal Gurung, Savage x Fenty, Tome, Christian Siriano, Michael Kors, The Blonds, Opening Ceremony, Marc Jacobs, Coach 1941 and Marco Marco’s shows all exemplified true, all-around inclusivity. Chromat, per usual, had it all: cancer survivor and amputee Mama Cax walked, as did hijab-wearing model Kadija Diawara and plus-size models Emme and Mia Michaels, the only fuller-figured women over age 50 to be cast in any New York show. (And likely any Spring 2019 show, period.) Almost 92 percent of Chromat’s models were women of color, three were transgender, two were over the age of 50 and 13 were plus-size — again, the most of any show that week. Tome was notably size-, age- and race-inclusive with close to 64 percent models of color, two plus-size models and two models over the age of 50. As stated previously, Siriano’s show was the third most size-inclusive of the season (with eight plus-size models), in addition to being almost 59 percent nonwhite. 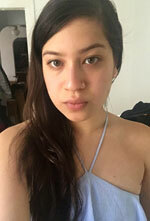 Another surprising development: for Spring 2019, 37 years after Michael Kors first launched his brand and just a year and a half since he cast his first plus-size model (Ashley Graham in February 2017), the designer had one of the most all-around inclusive lineups of New York Fashion Week with 56.4 percent models of color, two plus-size models (one of them mixed race) and one transgender model (Teddy Quinlivan). Marc Jacobs and Coach 1941’s Spring 2019 shows, while not especially ethnic (at the former, only 38.5 percent of the models were nonwhite, at the latter just 37 percent), did particularly well at gender representation, especially as compared to most other luxury labels. 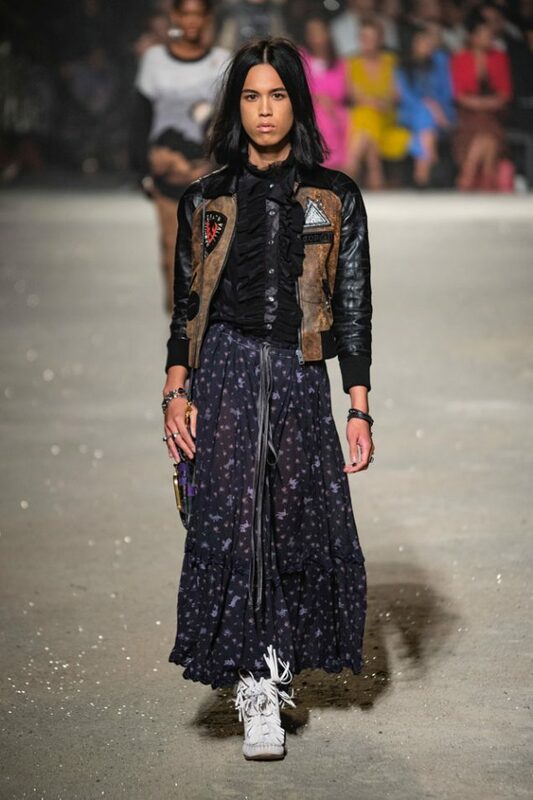 Two transgender models, one of them nonwhite, walked Marc Jacobs as did one non-binary model. At Coach 1941, we counted three transgender models, one of them nonwhite, another of whom identifies as non-binary. Of course, The Blonds and Marco Marco did even better. Phillipe and David Blond’s ode to Disney villainy starred almost 59 percent models of color, three transgender models (all of them nonwhite), one drag performer and one non-binary model — Phillipe Blond, who opened the show. Meanwhile, Los Angeles-based underwear brand Marco Marco made history by hiring an entirely transgender cast — 60 percent of whom were nonwhite — to present its new Collection Seven line. Finally, on a related note, credit is due to Humberto Leon and Carol Lim of Opening Ceremony, whose Spring 2019 line was modeled exclusively by transgender models (4) and drag queens (21), 43 percent of them nonwhite, two of them non-binary, the whole group stunning representatives of the LGBTQIA+ community. Season in and season out, our diversity report takeaways stay much the same: that the industry has a long way to go when it comes to inclusion, that the principle always seems to be one step forward, two steps back. But this season’s results were more straightforwardly optimistic with a startling number of New York designers making serious strides toward genuine diversity. Over 40 percent of New York’s runway models were of color; our list of all-around inclusive shows ran longer than ever; unprecedented numbers of plus-size, over-50 and trans and/or non-binary models walked. Even though age representation wasn’t as strong as we’d hoped, it’s clear New York brands are getting away from tokenism, especially in the race, size and gender identity realms. Not only that, the progress seems solid. Should heavy hitters like Opening Ceremony and Marco Marco decide to up and move their celebrations of individuality elsewhere, there will still be plenty of diversity-championing brands around to pick up the slack — at least in New York. Only women and non-binary models are included in this data. Models of color are categorized as those who are nonwhite or of mixed backgrounds. Fall 2018 collections that showed during the Spring 2019 season are included in this report.